Fourth of July is fast approaching, and you’re hosting this year’s celebration. Have you already planned the menu for your feast? Are you going for the usual all-meat barbecues? Most likely, so it’s safe to say that it isn’t the most vegan-friendly holiday, right? Nonetheless, it doesn’t mean you can’t invite your vegetarian family and friends for a backyard BBQ grill out this summer. In case you didn’t know, there are tons of vegan-friendly barbecue recipes that are as delicious as the traditional vegetarian bbq recipes. Here are some finger-licking recipes to have the best vegan barbecue! After preparing everything you first, fill a pot with about 3 inches of water and place it in a steamer basket. Bring it to a boil then put the cauliflower in and cover. Let it steam until the cauliflower can easily be pierced with a fork. That’s good for about 15 minutes. Once it’s done, set the cauliflower aside to let it cool, then finely chop it. In a large pan over medium fire, heat the oil and evenly spread throughout the skillet. Saute the onions until soft and transparent. Stir often. Next, add the tomato paste, strained onions, and seasonings to the skillet and bring to a boil. From medium heat, set it to low. Add the finely chopped cauliflower and stir until it’s thick and reduced. Last but not the least, add the meat crumbles and stir to combine well. Cook it for 3 minutes. The first thing that you need to do is cut or slice your tempeh up into cubes. An inch or so will do. Place them in a plastic bag along with all of the other ingredients and marinate for at least one hour to 24. Stick them on a skewer and grill over a medium to high heat until nice and scorched. You can also throw in some zucchini, red onions, and mushrooms. You can broil them first and cut them into cubes or thick slices–your call. It’s super easy to make, and you need not break a sweat! You first have to prepare the jackfruit by draining and rinsing it well. Remove the tough inner cores and discard. Bring the chicken broth to a boil then add the jackfruit. Let it simmer and cook until the majority of the soup had been evaporated. Drain any excess liquid. Next step, preheat your oven to about 425 degrees. Grab your most favorite vegan BBQ sauce recipes and add about 1 & 1/2 cups or more to the jackfruit. Mix well and make sure to shred up pieces of jackfruit that aren’t shredded yet. Afterward, spread the jackfruit out on a Silpat baking mat or parchment paper. Throw it into the oven and let it cook until it begins to crisp out around the edges. This can take about 30 minutes. Once it’s done, take it out and spread on a bun and dig in. Enjoy! 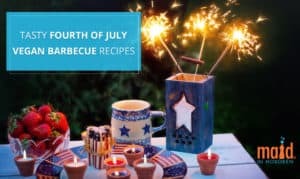 If you’re hosting this year’s Fourth of July bash, you’d know that aside from planning the perfect menu, satisfying all your guests is a mind-boggling task to do. Therefore, it’s essential to include vegetarian-friendly dishes for your vegan pals. It’ll be a total win-win for everybody! Oh, and if you need help with the post-party cleanup, you can always call in a trusted cleaning service to lend you a professional hand!